Women voters were turned away this morning without voting in Langatta and Kibra constituencies because their names are missing in the IEBC’s manual register. The confused elderly woman after being turned away by IEBC officials because she had the old generation ID. Between 6:00am and 8:00am, more than twenty women had already been turned away without voting at the District Commissioner’s grounds polling station alone. Among those whose names missed in the manual register was Map Kibera Trust SMS reporter Mildred Anekeya. She complained and persisted for more than 7 hours, later her name was found in the BVR register and she was allowed to vote at 12:02pm. An elderly woman was turned away at the DC’s grounds polling station because she had the old generation ID. Women carrying babies on their backs were also turned away in many polling stations particularly in Sarangombe and Makina wards where the manual register was used. At Mashimoni primary, a woman delivered on the queue. She was rushed to Freepals Maternity Health Centre for help. 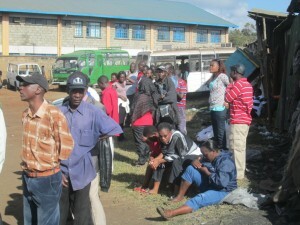 Another pregnant woman collapsed after queuing for more than two hours at KAG Olympic station. Medics from MSF Belgium attended to her and she was later allowed to vote and go home. At Old Kibera primary, 50 people were turned away because of the same problem. BVR kits failed to operate in Olympic, YMCA, Ayany, KAG Olympic, Old Kibera primary, DC’s grounds, Soweto Resource Centre among other polling stations, forcing the polling officials to use the manual register. Electricity fluctuations in most polling stations were the main reason for the failure, though in some instances, the system was very slow, forcing IEBC officials resort for the manual register to speed up the exercise. 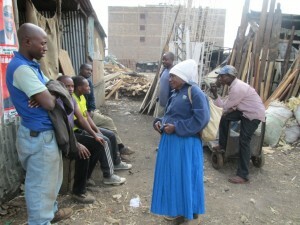 This entry was posted in Elections, Kibera. Bookmark the permalink. This was excellent, keep up the good work.